Everyone needs an FA-SM Station Manager. I got one after using a BX-184 (boxed) for a while but wanted some more features. A voice keyer with up to 60 seconds memory in total. 4 memories are available that can have different not predefined length’ as long as the total duration does not exceed 60 seconds. 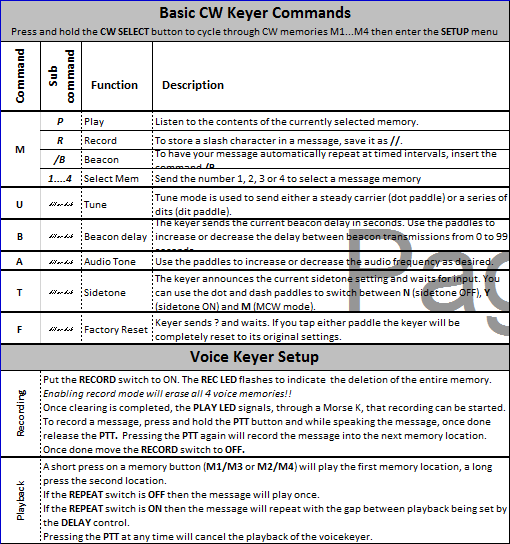 All stored voice messages can be played once or being repeated automatically. Pause time between repeats is adjustable between 0 and 30 seconds from a pot on the front panel. Recording is done through the attached transceiver microphone. 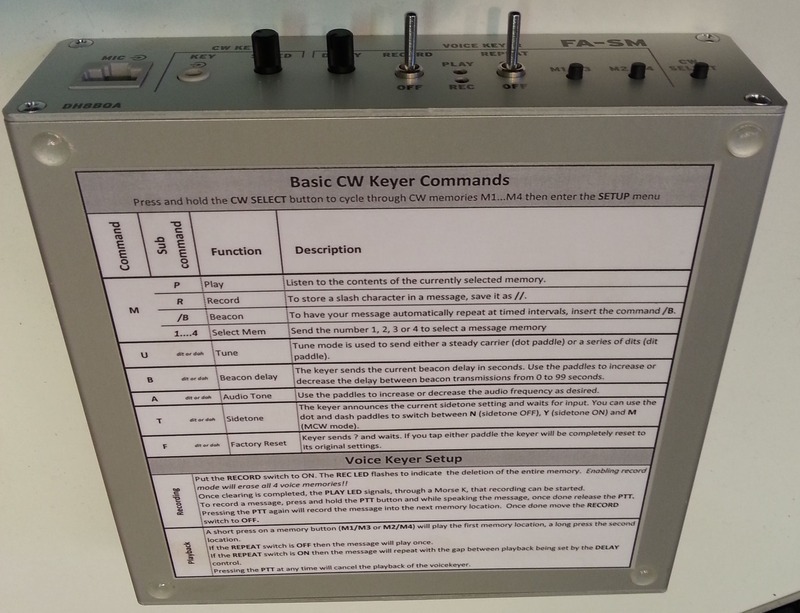 A CW keyer using the famous NØXAS design, aka "Picokeyer". It includes 4 memories with max. 60 letters each, Iambic modes A and B, bug mode, contest mode (auto numbering), side tone, paddle change, beacon mode, etc. Keyer speed can easily be adjusted through a pot on the front panel. A 4 channel sequencer making sure that attached pre-amps, power amplifiers, transceivers, etc. are timely switched on and off in a safe way. The sequencer takes the usual CW problem into account, too. Basically it’s the implementation of the DH8BQA sequencer with a few extras. The build was quite easy. The supplied, or downloadable instructions, made construction easy. There is little I can add but I really like this unit, we use it frequently at the G3PYE station. The instructions are in German but are easy to follow. John G4BAO provided me with some translated instructions, these were made using Goiogle Translate but are a good start; in Adobe Reader format (.pdf) or in MS Word format (.doc). A nice design consideration is the matrix type of jumpers on the microphone input and output connectors which allows easy configuration for a multitude of radios or configurations. I’ve not got round to making a post on my CQ Enhancer but I thought I’d mention it as I modded my FA-SM in 2 ways to allow external control. You can see the first one I done which is the additional 3.5mm socket in the middle marked “REMOTE”, this is a stereo socket and it simply has the tip going to the ‘M1/M3’ button and the ring going to the ‘CW Select’ button, basically using this socket you can play a voice memory or CW memory by grounding the corresponding connection. The second mod was little more brutal, I re-wired the ‘DIGIMODE I/F’ 6pin mini DIN socket by cutting some tracks and adding some wires to bring out Ground, PTT In (footswitch), PTT out (voice keyer active), ‘M1/M3’ button, ‘CW Select’ button & +12v connections on the 6 pins. 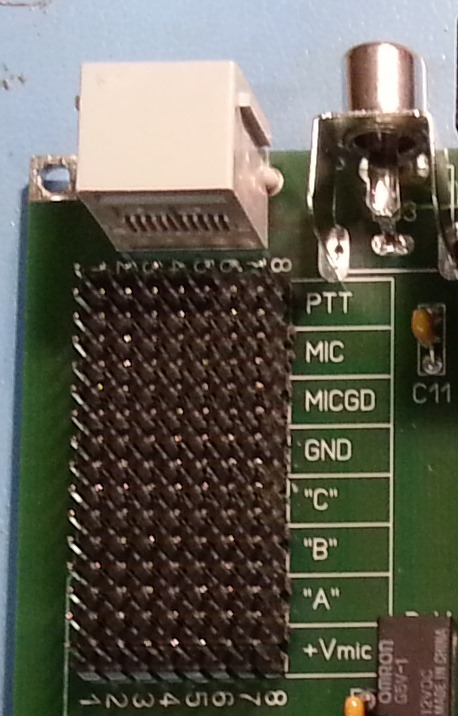 This allows my CQ Enhancer project to be powered by, and control, the FA-SM. The CQ Enhancer also controls a rotator. 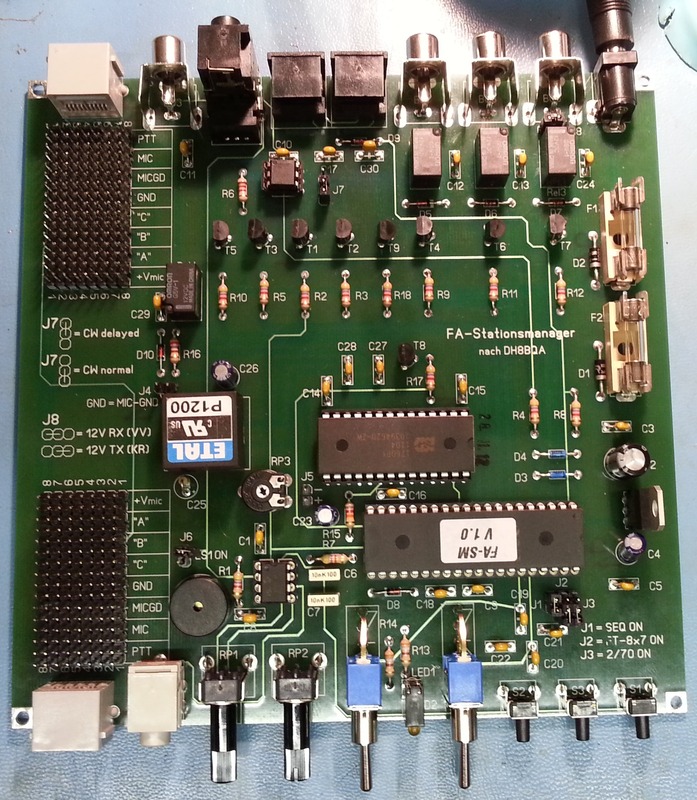 A rotator you say, yes, the CQ Enhancer project interfaces with both the FA-SM & a rotator. 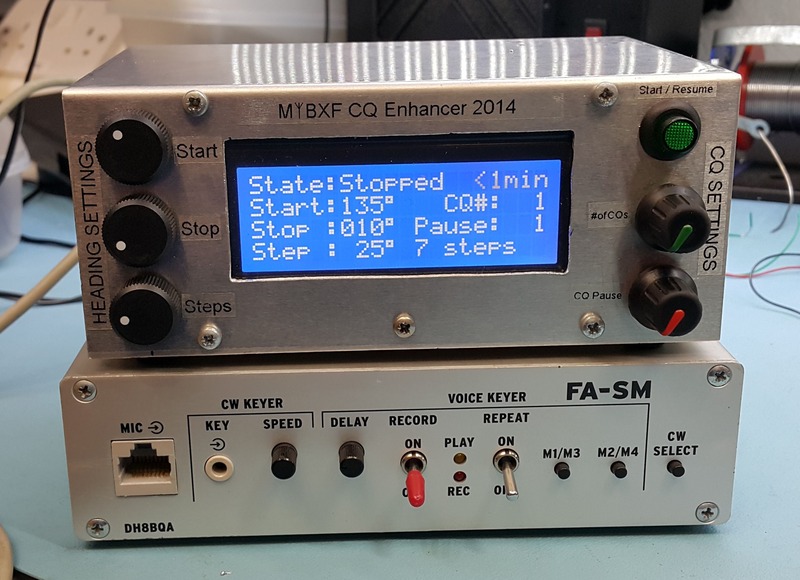 In basic terms the CQ Enhancer tells the FA-SM to call CQ for a selected number of times (voice or CW), with a given pause time, then the CQ Enhancer commands the rotator (over GS-232) to move to the next heading based on the start, stop and step degrees it then tells the FA-SM to call CQ again, changes heading, and so on. Once the rotator reaches the end heading, it simply starts moving back the other way. This was built for quite periods in contests where operator attention might be elsewhere, by automating the cqing and antenna movement it’s hoped that you increase the chance of being heard by someone. 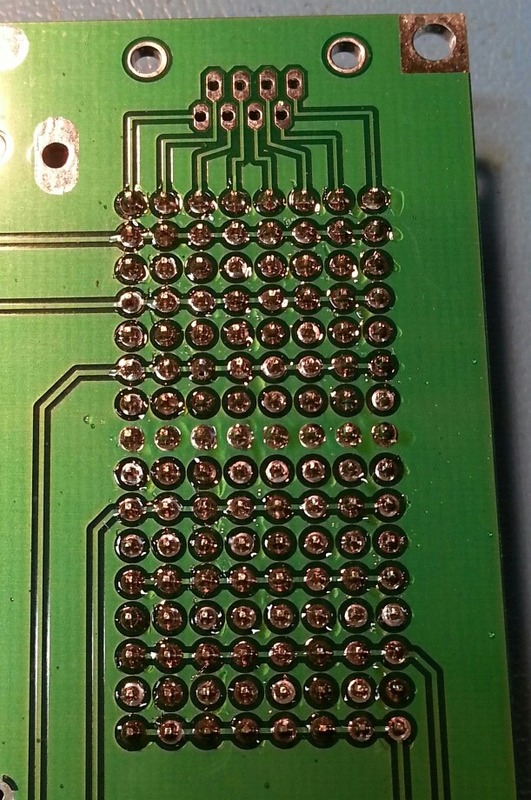 If the user hits the PTT (footswitch) the whole thing pauses, this is why the CQ Enhancer need a connection from both footswitch PTT and the voice keyer PTT. 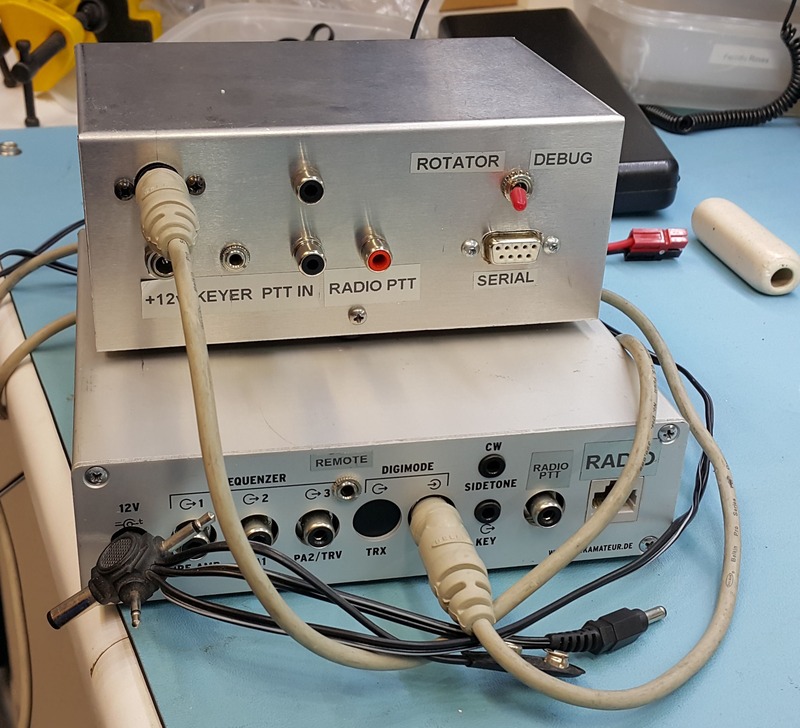 The voice keyer PTT is used to ensure the pause time is only incremented when the radio is in RX, or more accurately when nothing (footswitch or voice keyer) is in PTT state. When I get time I’ll post more on the CQ Enhancer project. One thing I done was to create a cheat sheet to attach to the FA-SM case so the usual functions were clear to the user. Then attached it to the bottom of the FA-SM. Hi, Considering getting an FA-SM, how much was it in Euro’s please? was getting the kit easy enough? I note your post is quite recent……..